Just as usual, I went to the back yard on that fine Saturday, to keep food for my lovely winged friends & tree top tenants! 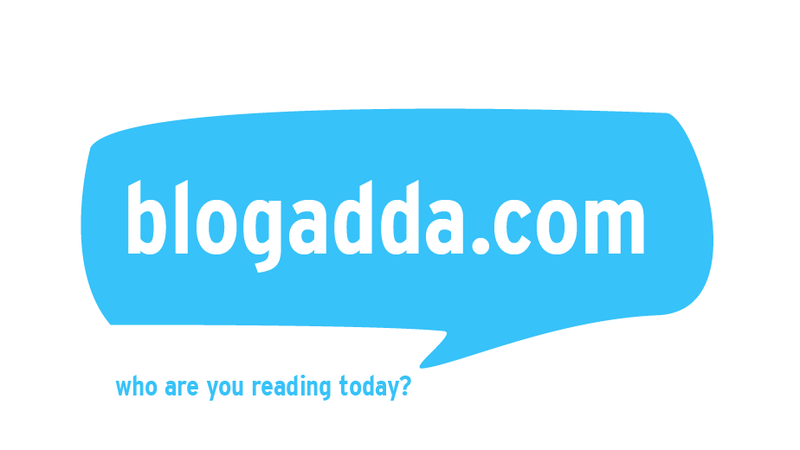 (If you haven't read the last post, you may not know what I'm talking about, read it here). And weirdly the White Headed / Yellow Billed Babblers started shrieking as I walked towards the compound wall, a shriek similar to the presence of a predator. I wondered if there was any cat on the other side, there wasn't. The shriek did not subside. I tried to see all over on what was wrong and I spotted a small black stone that was 'moving'! Errr.... Well, I went over to see that and...... it was a very very small juvenile babbler. It must have fallen from the nest or a koel might have pushed it away to lay its own egg in babbler's nest, no clue! I tried to spot where its nest was but at vain. I left it there for sometime to see if the adults around (there were 5 adult babblers around), are feeding it or anything. But sadly, they didn't. I couldn't leave it there. I had no clue if the adults would take care. Cats were very much in our locality and it could be preyed upon. Adult crows may also prey on it. Another problem is that it had rained the previous day and the soil was wet. The juvenile was shivering in the cold and was too weak to move about. Then dad pitched in and we placed the juvenile babbler on a drier rocky place. And waited far away to see if the adults fed it, but unfortunately the adults did not even come near it. And I had to do something about it. I had a small abandoned nest that I had preserved since some time back. I kept a few cut jute threads for cushioning on it and placed the juvenile on it. 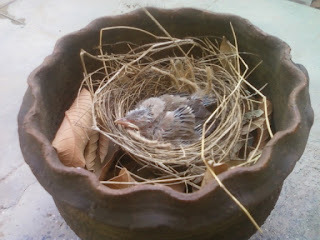 And took a terracotta flower pot and filled it half with dried guava leaves and placed the nest on it. My dad held it in hand for sometime to give it some warmth and I took an syringe without needle and fed some dilute milk for it. It drank and in some time it crapped on my dad's hand! 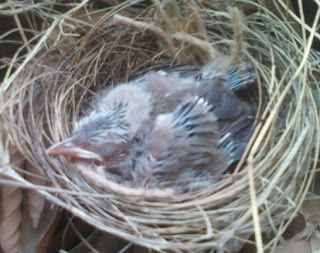 We left it on the nest in terracotta pot and I kept feeding with the dilute milk, at my back yard, near the door. I kept my palm over the juvenile, to give it some heat and it got relaxed and slept. It woke up often and I fed it with milk, obviously I cant hunt for insects to feed it!!! Soon the adults came screeching near me. I left the terracotta pot out to see if the adults came down to feed it. Again they didn't. And crows circling made me bring in back near me. Again the adults kept screaming. This time some of them had worms in their beaks. So I left it out again. This time the adults came down to the little one. By this time the juvenile had drunk quite some milk and crapped once more. The adults gave food to it, insects & rice. And cleaned the nest off the crap as well!!! The day went on like that. And after sometime when the sun started to come onto that place where I had kept that pot, I re-positioned it in the shade beneath a tree. It was a much more comfortable position for the adults as they were in a homely location. The insects were much more in soil and between stones and gave it quite a lot of food and it kept on eating. That noon mom & I took turns to sleep coz we didn't want to leave it alone. Its was fine with adults taking good care of it now unlike early morning when it was ignored, but even the adults may not be able to save it, if a cat comes by. Later in the evening, it was still in the nest in the pot. I couldn't leave it outside, coz at night again, cats may come by. So I took it in. I had a old piece of denim cloth. I covered it with it to give it warmth and covered the pot with a sieve. The adults were agitated when I took it in, but I really didn't want to leave it out. It can't even fly or run if attacked. It rained that night too and the juvenile slept well inside. The next day as I opened the door at about 6 AM, the mother was waiting at the compound wall with food in its beak waiting for its baby to come out! I brought it out, opened the sieve and cloth. Today the birdie was a bit more healthy. It was continuously fed the whole day by the adults. And btw, the crows were not allowed anywhere near, by the adult babblers, for their regular food from the compound wall!!! The day went by just like the previous day and later about noon happened a miracle! The juvenile got up and got out of the nest and pot, all by itself!!! It sat there where it jumped down. By now, it started walking about. The whole day it walked up and down the garden! And that night, dad caught it and placed it in the nest again. I softly placed my palm on it for warmth and it got relaxed and slept off. It was a Sunday night and it slept inside our home, in the pot, covered with denim, covered with sieve. Next morning as I kept it out with the adults were waiting for me. Again the juvenile got up and got out of the nest and pot, all by itself and walked about in the garden guided by the adults. At one point of time it was sitting very close to a rat hole! And when dad tried to move it away from the hole, it fell inside it! However when he opened up the mouth of the hole a bit more, I came running out!!! And today it successfully climbed little rocks and barbed wire fence!! Its sitting on top of the lowest horizontal wire of the fence, in the above pic!!! It crossed the barbed wire and went over to our neighbor's place and sat happily beneath their car. Again feeding by the adults continued. It roamed about in their garden too. I kept going there like once an hour or two to keep a check on it. Once when I went it was trying to climb a iron grill gate and had climbed atleast a foot high, from ground!!! That evening, it was much more difficult to catch it, but my dad did and placed it in the nest. Again denim, again seive and it slept off. Unfortunately being a Monday, there were quite a lot of visitors at home and it was woken up but the chitter, chatter by some 7 and I had a difficult time to make it relaxed again and make it sleep. The traffic was also heavier and so were the vehicle horns than weekend, which kept disturbing it. The adult babblers had retired for the day by then. I had to sit beside it the whole evening till night to re-assure it and keep it relaxed. Next morning, unlike so far, it had woken up before 6 AM, before I could come to it. It was talking from inside to the adult which was talking to it from outside! I left it out and today again it immediately started walking. And it could infact, sort of fly! It was more like floating, running and jumping mixed up and it could jump for more than 1.5 ft without touching ground!!! It looked head-on to us when we walked by. That day it walked (or rather jumped & shallow flew) across the road and went over to an empty ground opposite filled with wild trees and plants! Ofcourse I couldn't guard it anymore, it was on its own and the 5 adults. Later on for a day or 2 the babblers did not turn up. Then they started coming. But now there are just 4. It means the juvenile and its mother might have chosen to join another group. All I'm worried about is that the juvenile made it through its night at that ground and I hope it survived. Well, I'll never know!!! Btw, wondering about the title??? Well, first when I saw it, I mistook it for a jungle babbler, and mom called it Vanya which means Jungle in Hindi/Tamil/Sanskit!!! No, I don't know if the juvenile was a male or female, though Vanya is a female name!!!!! An extra-ordinary post. God bless you. agree with PNS...an extraordinary post indeed! A happy ending almost unlike my episode with the fledgling golden backed woodpecker which dropped out of nowhere, perhaps its nest in my yard. After 4 days of trying to feed it and even keeping it sight of the mother who appeared but showed no interest, it died. It looked a little deformed in the abdominal region and that may have been the reason. Nature's way is different from ours. I did have a bulbul fledgling that fell out of its nest. We put it in an open cage near the window in Mangalore, where I was studying my medicine. The parents came everyday and fed the fledgling until it was big enough to fly away by itself and that was a happier story. Thank you very much for the posts about Vanya. We pray that his/her life is more complete. Very touching and well done. I was so disheartened to know Woody died. Thank God the Bulbul had a happier ending. Me too hoping Vanya is still alive!!! This is such a lovely and heart warming story.God bless you and your dad for providing kindness,protection & feed to the young juvenile and nursing it to health. You brought a new hope,delight and enthusiasm for the adults. You are two lovely and wonderful human beings. Thank you so much Ram Sir. “You certainly did your very best to care for the little bird. That was a heroic and quite successful effort, and I hope the baby did survive. I was a licensed wildlife rehabilitator for many years and took care of hundreds of baby birds. The thing to do, in case you ever come across another baby bird who needs help, is to look now for an organization that cares for orphaned and injured wildlife. In every city there is always someone who knows how to do this, and then you can take a baby bird to them. If you let me know what city you are in, I'll see if I can locate a wildlife rehabilitator for you -- in case it ever happens again -- which it may since you are a kind person who cares about birds. Blue Cross was my next option if the adult babblers abandoned the baby. Since the adults did not abandon, and kept feeding the baby, and the baby was not injured as well, I felt it was not right to separate the child from its parents. Thanks for your suggestion. I do have the Blue Cross Velachery number. Thanks again for your kind appreciation. I love this post! I followed you over from a comment on my blog. Thanks so much for that, by the way! We just moved to a new apartment and we have a garden and pond in the back that is full of birds. I just love it. I've started feeding them each day and I've learned all of the family groups. I've even started naming them. My hubby thinks I've gone overboard. But, I just love watching them. Good job on taking such good care of this baby!!! Thank you for visiting and commenting doll! Welcome here dear! Do visit often. No sympathy for the worms? 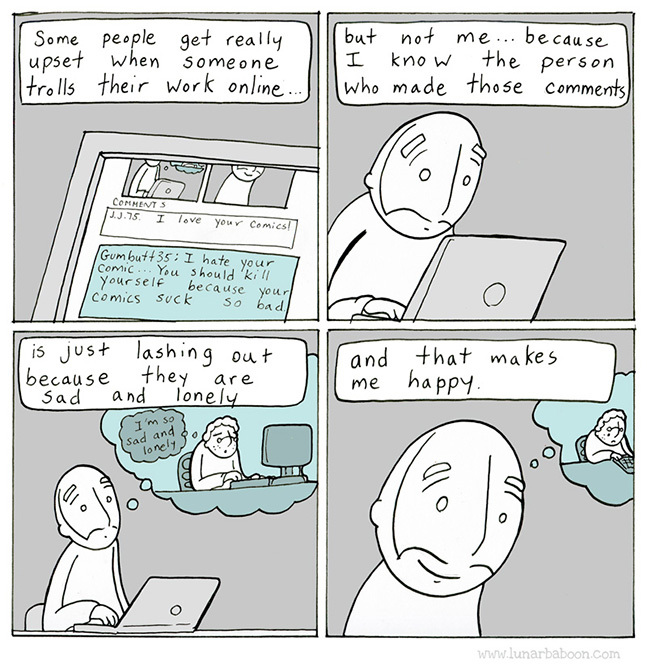 I read this post today and was totally engrossed in it. The babbler was really lucky to have found people like you and your family who took such good care of it. I am sure it would have survived.